The Black Sea region comprises a heterogeneous group of countries: Bulgaria, Romania, Ukraine, Russia, Georgia, Armenia, Azerbaijan, and Turkey. Their economies differ in their size, institutional characteristics and integration perspectives, are facing vastly different problems, and find themselves at different levels of development. The economic performance of the region during the 1990s was highly unstable, and even the countries which were spared from internal conflicts did not fare much better than the rest. However, more recently, the region has enjoyed a fairly rapid economic recovery accompanied by welcome structural changes, although the labour market situation and social conditions in general are still very difficult. 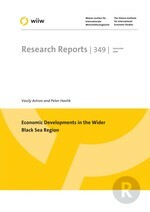 Both the economic heterogeneity of the Black Sea countries and political issues are crucial factors behind the presently rather low level of their regional integration: the latter generally proceeds only to the extent to which it is compatible with the (very unequal) format of these countries' relations with the EU. At the same time, multilateral integration under the auspices of Russia, which, given its economic size, could potentially serve as an alternative 'gravity centre', appears to be for a number of reasons equally problematic. In fact, the geographic trade patterns of the countries involved do not give an impression of the Black Sea region being a distinct trading block per se, and in those cases where important regional trade links do exist (Russia, Ukraine and Turkey), this seems to be explained first of all by these countries' size rather than by the fact that they are part of the Black Sea region. The outlook for the Black Sea countries is largely positive, with annual GDP growth in excess of 5% in the medium and long run being feasible. Apart from sound economic policies, it is especially the fostering of institutional reforms and the related improvements of the investment climate which will be indispensable for a lasting and sustainable economic development. More decisive steps towards regional and EU economic integration would undoubtedly be beneficial; however, such integration would require significant changes in the stance of regional (and EU) policymakers, a higher level of mutual trust, a solution of 'frozen conflicts', and - last but not least - ultimately hinges on cooperation prospects between Russia and the EU.